Sesame opens up touch-screen phones to those with disabilities that limit the use of their hands. Instead, the technology works with smartphone cameras, tracking the range of movement in any body part and using that to navigate the phone’s functions. You can read, dial, post, and play with a nod of the head. 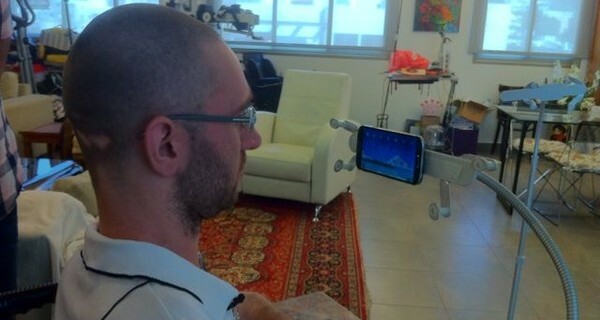 The technology was developed by an expert in computer vision, and veteran of the Israeli army’s intelligence unit, Oded Ben Dov – and a quadriplegic engineer, paralysed in an accident. The group has packaged the tech as a software development kit so it’s available to outside developers: they charge a fee for commercial applications but applications for disabled people are free. The tool, which is still in prototype, consists of an operating system that takes control of your phone. Once the camera has recognised the movement that will drive the controls, a cursor appears on screen that you can move to operate any application, with a box you check to confirm the action is the right one. Sesame’s name comes from the Ali Baba story, to imply the new worlds and opportunities it opens up to people with conditions such as cerebral palsy. Ben Dov is marketing it through rehabilitation centres and special education schools. ‘Wherever there is someone that can use it, I want it to get to that person because it really changes their world,’ he says. The business has six staff and is currently raising capital to match $200,000 in funding from the Israeli Office of the Chief Scientist.